Patients are dying alone on hospital wards because staff do not have enough time to care for them, nurses say. The mounting pressure across the UK is also leading to medicines being given late and patients being left in pain. The issues have been brought to light after the Royal College of Nursing canvassed front-line staff about their experiences of their last shift. But ministers said despite the concerns raised it was investing in nursing to ensure there were enough staff. The numbers working in the NHS have increased since 2010, but the RCN maintains this has not been enough to keep pace with demand. A report earlier this year by the union found one in nine posts were vacant. Some 30,000 staff, including midwives and health care support workers from across the UK, took part in this new online research. The RCN described some of the stories as "desperately sad". Staff revealed how they had ended up parachuted into departments they were unfamiliar with to provide emergency cover at the last minute. For example, one nurse described how care had been compromised when cardiac nurses were sent to a stroke unit. Another nurse, who works on an elderly care ward, said she felt "useless, unsafe and out of my depth" when she was sent to A&E. Others described how the demands on them had compromised care and left them in tears after their shift. And there were reports of situations where patients had died alone on their watch because they simply did not have time to do everything that was needed. The RCN said it knew of a number of hospitals which had been forced to rope in volunteers to sit with patients at the end of life. One nurse told the RCN: "I often go home in tears. I love being a nurse but I feel I am unable to do my job properly." The nurses all took part on an anonymous basis. But one nurse who was willing to be named was Chris Perry, a former director of nursing in the south-west of England who retired earlier this year. She said the stories in the report were "sadly all too familiar". She described how she found herself having to "scrabble around" trying to find staff to fill gaps and said despite being willing to pay the most expensive agency prices, she could still not fill rotas. She said it had now reached "crisis" point. "We are seeing patient care suffer," she added. The RCN said more than a third of those who took part in the online survey in May reported having to leave elements of patient care undone because of a lack of time, while two-thirds worked extra time unpaid. RCN general secretary Janet Davies said: "When this many professionals blow the whistle, they cannot be overlooked." 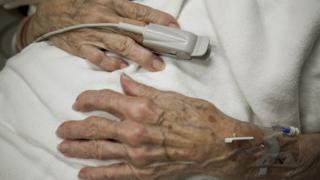 But the Department of Health, which is responsible for the health service in England, said it was investing in nursing. It pointed out the numbers in training are increasing - there will be another 10,000 more nurses by 2020 - while the overall number on wards had increased over the past seven years. "We are helping the NHS to make sure it has the right staff, in the right place, at the right time to provide safe care," a spokeswoman added. The Scottish government said it had committed to enshrining safe staffing in law and creating about 2,600 extra nursing and midwifery training places over the next four years. Scottish Health Secretary Shona Robison said: "The link between safe and sustainable staffing levels and high quality care is well established. "Scotland has led the UK in the development of nursing and midwifery workload and workforce planning tools, ensuring we have the right number of staff, with the right skills, in place."